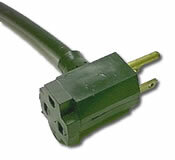 Septic Solutions offers a wide variety of float switches for septic tanks and septic systems. We have a septic float switch for nearly any application. Pump duty float switches are designed to control a submersible pump. Control duty float switches are designed to be connected directly to a control panel to signal high and low level alarms. Deciding which control switch to purchase is much easier. The main option you have is whether you want mercury or mechanical. No control switch will ever come with a plug, again because it will be wired directly to a control panel or alarm box. Also as explained earlier, you have “PUMP DOWN” and “PUMP UP” versions. The “PUMP DOWN” version will be used for HIGH level alerts. The “PUMP UP” version will be used for LOW level alerts.